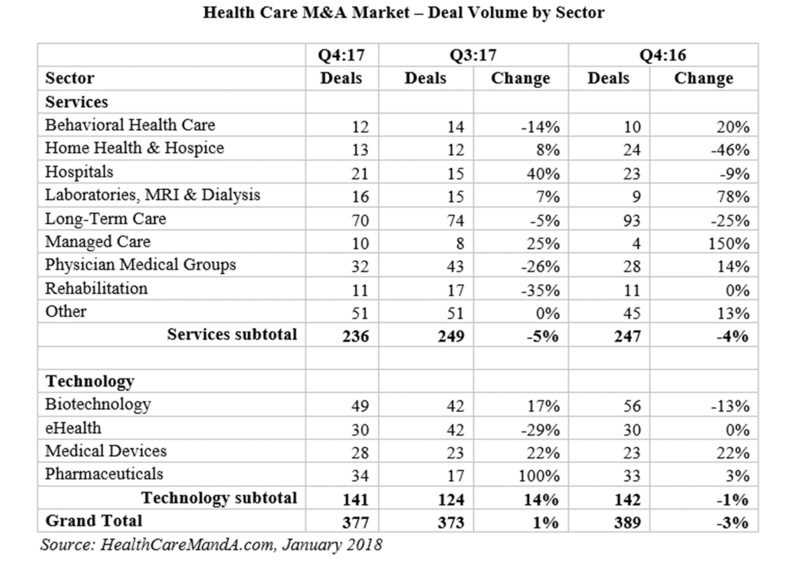 Healthcare mergers and acquisitions increased 1% in the fourth quarter of 2017, while deal value posted a sharp increase of 166% compared with the third quarter. Long-Term Care remained the most active of all the sectors, although quarterly deal volume continued to slip. The 70 deals announced in the recent fourth quarter are 5% lower than the previous quarter (74 transactions). Among the services sectors, Hospitals, Laboratories/MRI/Dialysis, Rehabilitation, Labs and Other Services were the only sectors to equal or increase deal volume levels above the previous quarter. For more information on the HealthCareMandA.com investment research source, or for a membership to any of Irving Levin Associates’ services, please call 800-248-1668. Irving Levin Associates, Inc., established in 1948, is headquartered in Norwalk, Connecticut and is online at http://www.levinassociates.com. This privately held corporation publishes annual and quarterly research reports, monthly and weekly newsletters, and maintains merger and acquisition databases on the health care and senior housing markets. If you would like to receive future releases, please email pressreleases@levinassociates.com. 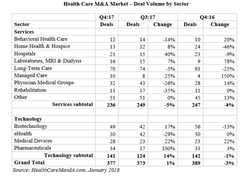 Health Care M&A Market - Deal Volume by SectorA chart of the fourth quarter's health care mergers and acquisitions.